In an age where it's now possible to buy a dual-core laptop for less than £750, it seems hard to justify spending almost double that on a system like the Asus V1J (£1399 inc. VAT). However, it isn't just about base specification, it's as much about how you make the most of the design as it is about meeting a price point. The chassis is made from solid and robust plastic, and the black and grey casing is rather sombre. The touchpad and mouse buttons are flush with the case, adding a hint of understated cool to the design. You'll find a biometric fingerprint scanner has been incorporated and, because this is recessed, it doesn't get in the way. 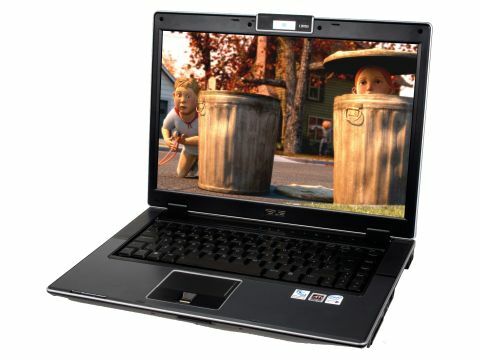 Powered by an Intel Core Duo T2400, which runs at 1.83GHz, you'll find it supported by 1024MB of DDR2 memory. While not especially exceptional, this laptop returned a MobileMark 2005 score of 261, which isn't so much impressive as outstanding. In daily use, we found this system could really fl y, handling tasks with ease, making it a pleasure to use. The keyboard is a decent size and the keys are well-spaced. While it's not the most robust keyboard we've used, and certainly doesn't match the Lenovo ThinkPads for durability, it's comfortable to use. With a battery life, under test, of 193 minutes, this isn't the most mobile-friendly laptop available and weighing in at 2.9kg, it's about as heavy as you'll want from a machine with a 15.4-inch widescreen panel. It seems a little strange that Asus should fit the laptop with a standard TFT panel, which is still the preferred business panel, then support it with the ATi Mobility Radeon X1600, which comes with 512MB of dedicated memory and is definitely on the list of requirements for gamers. True, there are faster graphics options available, but they tend to be for bulkier machines than this and, while the 3DMark 2003 score of 6825 is a good score for such a card, you'll be able to play games with a degree of speed with reasonable resolutions. It's the little extras that take this laptop away from being a standard machine to an impressive laptop. You'll find a PCI- ExpressCard slot on one side of the case, while on the other, a mini-adapter for connecting to a digital source via the DVI port, as well as a standard dual-layer DVD rewriter optical drive. It may be hard to justify spending £1400 on a laptop, but when it delivers the kind of performance the Asus V1J does, it makes it easier to explain to your financial manager that this is the right machine for you. There are a couple of minor niggles and the keyboard could have been more robust but, for performance, the V1J is simply hard to beat. The standard warranty the company offers is a two-year collect and return, so you won't need to worry about extra expense for covering the cost of returns. However, it's worth reading the small print, as this may not include consumables such as the battery.